For centuries now, visual communication design has celebrated national identities (through the now-iconic identity systems developed for the Olympic Games, for example) at the same time as it transcends international borders, such as through the far-reaching influence of the Bauhaus and the International Typographic Style. Today, of course, such transcendence is easier than ever. In an era of nearly instantaneous global access, enabled by increasingly ubiquitous wireless connections, the world seems very small. 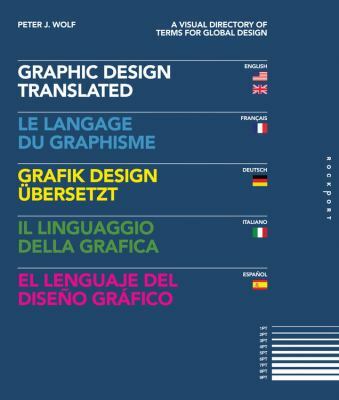 Presented in five languages-English, French, German, Italian, and Spanish- Graphic Design, Translatedis a reflection of the increasingly international nature of visual communication design. Illustrated with examples from around the globe, the book is a compilation of more than 200 of the profession#x19;s most common terms, culled from a broad range of categories: design history, printing and paper, typography, digital technology, and general design practice. All of which makes this volume an essential reference for students, practitioners, clients#x13;indeed, anybody interested in the global scope of today#x19;s visual communication design.